How do I upgrade my weapons? He is located in the Nexus, next to Stockpile Thomas. He is located in Stonefang Tunnel (2-1), just up the steps from the archstone. You'll need to activate the revolving platform that leads to him. Advanced upgrades using Demon's Souls or Colorless Demon Souls are only available after you give the Red Hot Demon's Soul to him. You can obtain the Red Hot Demon's Soul by defeating the Flamelurker in 2-2. You must talk to Ed until he accepts it; otherwise, leave and talk to him again. 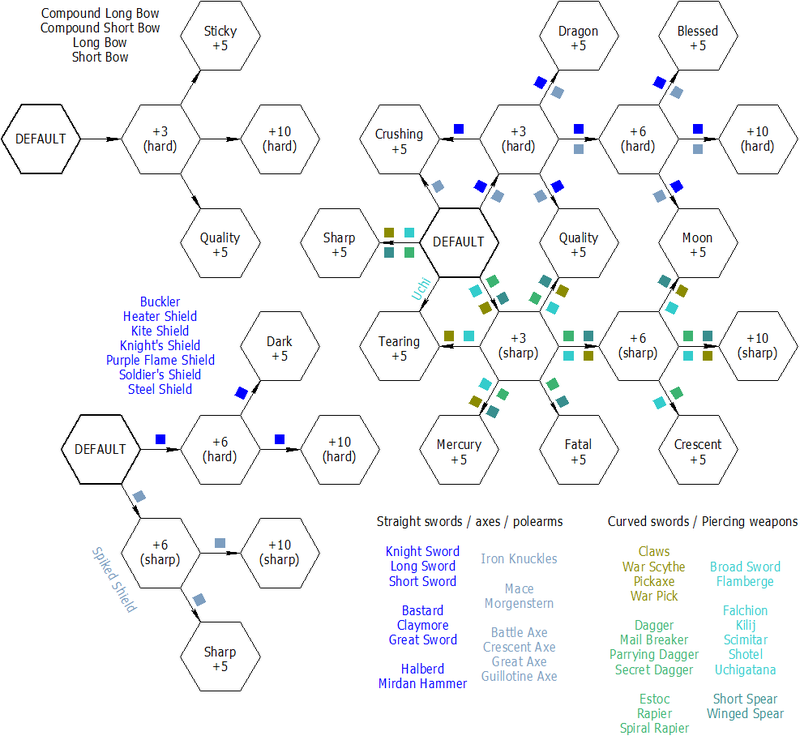 The planning spreadsheet can help plan out upgrades and includes where to find every stone type. How do upgrade stones work? There are fourteen types of upgrade stones that come in either three sizes for special upgrades (Shard, Chunk, Pure) or four sizes for basic upgrades (adds Lg. Shard to the progression). Basic weapon upgrades (Hardstone and Sharpstone) max out at +10, while all other upgrade paths max out at +5. Each upgrade costs a number of stones of varying sizes, and the number of stones need to upgrade increases each time. There are some weapons that can't be upgraded at all, and others can only be upgraded with Demon or Primeval Demon souls. Each type of upgrade stone allows for the creation of a distinct type of weapon, with special properties and bonuses. Many of these weapon classes combine damage bonuses from multiple stats (Stat Bonuses). Others may add special damage types or attributes such as health regeneration. Standard weapons that have yet to be upgraded must first be upgraded to a basic level like +3 or +6 using Hardstone or Sharpstone. Once this requirement has been met, options to upgrade with more advanced upgrade stones will appear in the Blacksmiths' menus. Also note that blacksmith Boldwin in the Nexus offers only limited types upgrades when compared to his brother Ed in Stonefang Tunnel. Neither blacksmith requires to have the stones actually in your inventory; you can keep them with Stockpile Thomas and still be able to upgrade weapons. If you are only interested in upgrading for the Platinum trophy, you'll need at least one weapon from each class upgraded to the maximum level, so upgrade whichever is cheapest in stones (this will be a weapon already upgraded to a degree or simply the smallest weapon in class). Otherwise, consider your playing style, character stats, available weapons and stones, and choose upgrades that will be best suited to your character and goals. Some weapons are better suited for general purposes, while others will be more useful in specific situations. For example, Silver Skeletons are weak against the blunt and magic damage of a Blessed Mace, so if you equip a Blessed Mace +5 in the Shrine Of Storms (4-1), you'll have an advantage, especially if your Faith stat is high. In contrast, the Blessed Mace might not be the best weapon in the Stonefang Tunnel where enemies are more vulnerable to piercing attacks. Another example would be if your character has low Strength, then it doesn't make much sense to quickly upgrade a Great Axe into a Crushing Great Axe +5, since it will cost many fewer stones to upgrade the Crushing Battle Axe +1 you can find in 2-1 to Crushing +5 for the trophy. Playing through the game normally you will find a limited number of Chunk and Pure stones for each upgrade type without spending a lot of time farming extra stones. This means you will probably only be able to fully upgrade one medium/large or perhaps two small weapons of each type per play through. Because upgrade stones can be bought in smaller sizes (Shard, Lg. Shard) from vendors, you can use those to experiment with low level upgrades. Below is a chart that shows all possible upgrade paths for common melee weapons, bows and shields, excluding demonic upgrades.